In our Costco frenzy yesterday, I grabbed as many produce items I thought would fit in the fridge. I had two choices when it came to carrots, five pounds of baby carrots or five pounds of full sized carrots. Both were organic and I’m thinking the full sized were cheaper. Who has time to wash and cut multiple pounds of carrots? Not me! When squash gets really cheap (anytime now), I don’t mind buying and roasting them. Until then, I am more than happy to buy the pre-peeled, pre-cut variety. As soon as we got home, the jumbo carton of butternut squash went into the oven with some olive oil, sugar and cinnamon on top (at 400 degrees) for about 40 minutes. It’s good cold or hot and makes both my toddler and preschooler happy. Score! I found a recipe from the original Moosewood Cookbook on Slash Food, before it moved to Huffington Post. Click the link to find the original recipe, the one below has been changed a bit to make life easier. I used pre-chopped onions and garlic, courtesy of Fresh & Easy. For the chopped nuts, a couple blasts in my Ninja blender did the trick. Place carrots, liquid and salt into a medium sized soup pot and bring to a boil. Cover and simmer it for 12-15 minutes. Let it cool to room temp. Saute the onion, garlic and nuts in the butter until the onions are clear. Towards the end of cooking, stir in the seasoning combo of your choice. Add roasted squash in batches. Puree everything together in a blender until smooth. I have to stop at this point and mention that the recipe makes this soup sound like it takes more work than it actually does. You could omit the squash if you didn’t roast any. I wouldn’t omit the nuts, they add a little crunch. It was pretty easy to make this, I swear and my whole family loved it. This is including Jy, who doesn’t consider anything a meal if it doesn’t involve meat. My local Costco sells Bolani, which is Afghan bread. We grabbed the spinach filled type and played around with the sauce trio also sold at Costco. It helped give our lunch a little something extra. Dallas (my four year old) really liked all the Bolani toppings, and they are spicy! I learn something new about my little crazy man every day. We ate Costco pizza at a super fun birthday party around 11 am. It was at this wonderful party where the sweet Katherine, introduced my family to Buffalo Chicken Dip. I think I said, “Holy. Crap.” about twenty times this morning. Each time was in between dip bites. I have never had this ridiculously addicting dip before, have you? Apparently, the rest of the world knows about the delicious, spicy Franks Red Hot Buffalo Chicken Dip recipe. Just google it, you’ll see. It looks really easy and hey, I even found a “light” version over at Skinny Taste! So that was lunch, pizza and lots of dip. Lunch was followed by more yuminess, a cookie cake! We all crashed at home and before hitting Costco for some produce I ate two pieces of cinnamon raisin bread. Too far of a stretch to call the raisins a fruit. Two cranky kids and Costco on a Saturday? Smart idea, huh? Luckily, Jy was there to bring us all hot dogs and fountain drinks while we shopped. Mmm…crap. See, junk food is so bad for you that it wreaks havoc on your vocabulary, all I can say is crap tonight. Crap, crappity, crap, crap. Speaking of, did you know that my dad used the word crap in a wedding speech? It was at MY wedding! He said that my husband let our dog crap in my parent’s yard. Guess the crap word runs in the family. Jy with my dad and brothers on our wedding day. The majority of today’s fiber all came from shredded wheat. The exercise was put off until night and well, you know how that goes. Getting in the ten servings of fruits/veg (I know I am really heavy on the fruit) will easily help me reach the fiber goal at the same time. And…the 30 minutes of exercise will happen after the kids are fed lunch. There, it has been written. It shall be done. Oh, we have (meaning Jy and I) added a 40 to the equations. At least 40 oz. of water. I know it doesn’t sound like much, but it is a lot more than the 12 that I typically drink. Have a great Sunday everyone! It’s almost a new season. Enjoy your OFFICIAL last Sunday of the summer! Also known as, Spaghetti Carbonara! Haven’t tried it? You should! It is one of the easiest and most filling meals one can make in under 30 minutes. In some cases, under 20. I blogged about Ruth Reichl’s recipe a couple days back. I followed her basic recipe tonight, but forgot to add some garlic flavor. Darn! This meal is so perfect for those nights when you have nothing planned to eat and 4 pm rolls around (tonight). We are trying to make a habit of cooking large amounts of eggs, rice and meat on Sunday, so we have plenty of go-to items for the week. This Sunday, I baked a whole package of bacon. All I had to do tonight was boil some whole wheat pasta (you can use white if you prefer) and slice up some bell peppers. Peppers are not part of the recipe, but they add a nice cool, sweetness to balance out the dish. As soon as the pasta is done, drain it and throw it back into the same pot you boiled it in. Immediately crack one to two eggs and give it a stir. By the time you drop in the chopped up bacon, sprinkle the parmesan and grate some pepper, the egg will be cooked! Try it, I promise it will be a new dinner favorite! I had planned to make a special meal for Jy and the boys tonight. All day Jy and I talked about making something fun like Gumbo, but I would call it Dumbo, because it would be kid friendly. Then we talked about making fried chicken, no…wait, creole chicken on top of beans and rice. See, we just watched an episode of Anthony Bourdain’s – No Reservations last night. We always get sucked into his show. He’s just so interesting and there is always something to learn when we watch. Food is just the tie that binds his show together. After our relaxing afternoon, strolling a local downtown that we don’t often visit, we decided to check out a local winery. An hour later, after getting lost and discovering that it would cost us a pretty penny to join the wine festival tasting that was occuring, we hopped back in the car. We are a pretty relaxed couple, so Jy and I decided to stop for a fun little lunch at Buffalo Wild Wings. Screams anniversary doesn’t it? I’m not sure why I have a Barry Bond bicep, but whatevs. After our mediocre lunches with sub-mediocre service, we decided to hit the grocery store for dinner ingredients. We made sure to shop for brownie needs, bbq needs (for Labor Day) and anything else we might be short on at home. Guess what we forgot to buy? Chicken, or any meat for that matter! We picked up our boys from my parent’s house and learned that rather than saying “Bampa,” which means grandpa in Max’s language, that he was saying “Obama.” At least this was according to my mom. She showed Max a photo of my dad with Obama and I guess Obama sounds a lot like Bampa. Once we got home, both kids were on the verge. Max was sleeping and didn’t tranistion to his bed well. Dallas wanted candy and brownies. While Dallas took a bath and Max slept, I added up today’s Weight Watcher points. My salad at BWW was 23 points. I had gone over my points for the day and used up all, yes….ALL my extra weekly allowance points. I’m still stuffed from everything I ate today, so missing dinner wasn’t too big of a deal. I am bummed that I wasn’t able to create anything to blog about though! Jy left to go take care of a dear friend’s kids while my pal took a trip to the hospital with her newborn. Baby is fine, mom is just getting checked out. Her husband left Jy some pizza, so it all worked out well. I’m sure he is happy to watch Sports Center in peace and hang in a house where the kids stay asleep! I couldn’t ask for a better man to have married! I decided to attempt another coconut flour recipe today. The last attempt taught me that coconut flour is a great ingredient to add when baking paper weights. The key to baking with this grain-free flour is to add liquid, a lot of liquid. I started off with my go-to muffin recipe from Mark Bittman in his encyclopdia, How to Cook Everything. Then, I swapped out a cup of white flour for coconut flour and doubled the milk. I also baked at 400 instead of 375, not for any other reason than reading the recipe wrong! After gently mixing the wet into the dry, I sprinkled in strawberries (about a cup full). Any berries would work well in this recipe. Coconut flour gives baked goods a springy texture. Your batter will be thick and biscuit like. Be sure not to mix until you have a smooth, cake type batter. That won’t fly with these muffins. I don’t often time my baked goods, I just grab them when the house starts to smell like whatever I am making. It’s not the best science, but it usually doesn’t fail. If you are worried, I’d say to stick with 375 for 40 minutes or 400 for 25-30. Coconut flour will also make your muffins look like they aren’t quite done. Just do the old toothpick trick and check for yourself, they will be baked through! You can also check the muffin bottoms to look for a golden color. As soon as mine came out, I spread a thin layer of butter over the tops and sprinkled with some raw sugar. Raw sugar just has a great texture to it that you don’t get with white. I just got back from jewelry shopping at my wonderful friend, Meghan’s house. She always throws the best parties and always, ALWAYS has the cutest baked good to go along with! 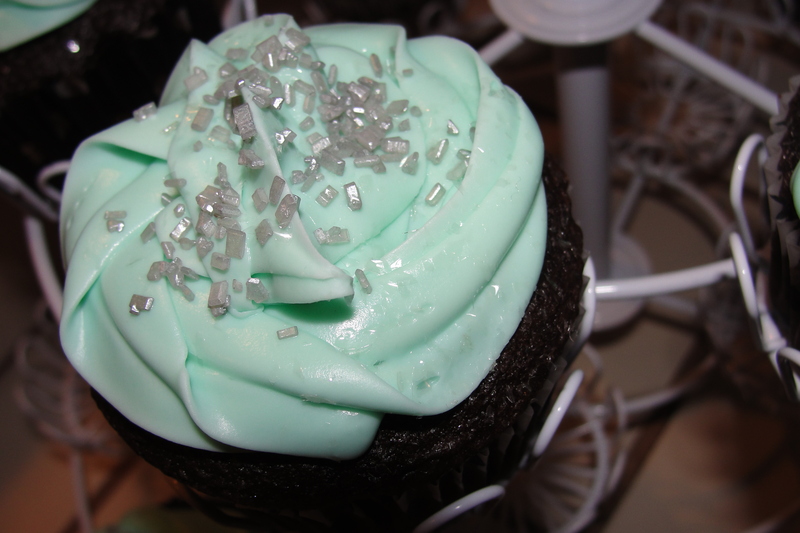 Tonight, she her frosted cupcakes matched Stell & Dot’s signature silver and uh…blue, teal, I don’t know what that pretty color is officially called. On the way over I learned something interesting. You’ve probably heard about using Olive Oil for cooking instead of Extra Virgin Olive Oil. Once you heat your pan, the EV in EVOO goes bye-bye. Guess what? The same thing happens with expensive onions. Sweet onions, sometimes called Vidalia onions are $4 or $5 a pound, versus brown or storage onions which should be around $1 a pound. The chemistry of the Vidalia breaks down in heat and all of that precious flavor evaporates! What you are left with is a bit of a flavorless onion. Go fig! So the rule is, if you plan to use EVOO cold (as a salad dressing or drizzled on other food) or onions uncooked (in a salad or diced up as a topping) then you will want to spend the extra dough. If your plan is to heat up a pan, go cheap! Have you ever seen this book? It’s a great read about a really famous food critic who disguises herself before tasting some of New York’s top restaurants. I loved this book and now I am so excited to have discovered that it’s on the way to becoming a movie. Ruth Reichl was interviewed in 2009 for NPR and the interview was replayed tonight. Reichl discussed one of her most popular dishes, which is also her “go to” dinner, Spaghetti Carbonara. One last thing…Happy Birthday Dad! Yum. That pretty much sums it up, folks. Oh, in detail? Ok, let me start from the top then. A half-dozen of us East Bay gals headed to the big, bad city. I lived in San Francisco while in college. For years after that, I would drive through S.F. and tell my husband that the city just felt like home. How times have changed! Two kids and a few sunny, suburban years later I am back to being totally intimidated by the fog laden, concrete maze. Wrapping my hair with my hands, (to prevent pre-dinner frizz) we hurried from our parking spot a couple blocks up the road to our location, Dosa! Our group organizer and her sister (who was with us too) have frequented Dosa and offered some great recommendations. Dosa is across the street from a new (to me at least) movie theater in what seems to be the Pac Heights-Japantown-Fillmore district. PacJaMore, anyone? No takers? Ok, on to the drinks. My description? Mmm. Nice and fresh with an interesting depth. I know I mentioned wanting to drink the Bollywood Hills, but once the waitress described the drink as a savory martini, I decided to pass. 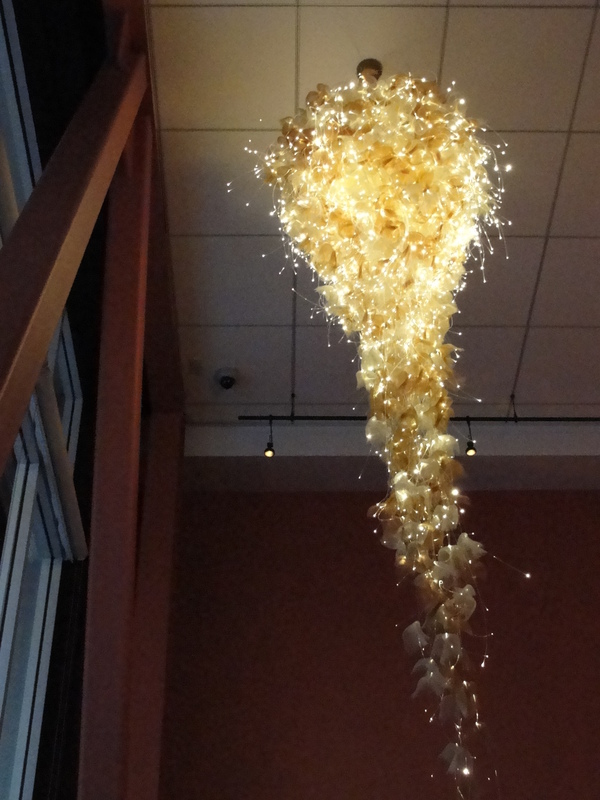 The majority of us opted for the tasting menu, which offers three courses for $35. First up, Chennai Chicken. We were warned ahead a time that this first dish would be spicy and while it was, there was also a side of cool raita (cucumber yogurt.) 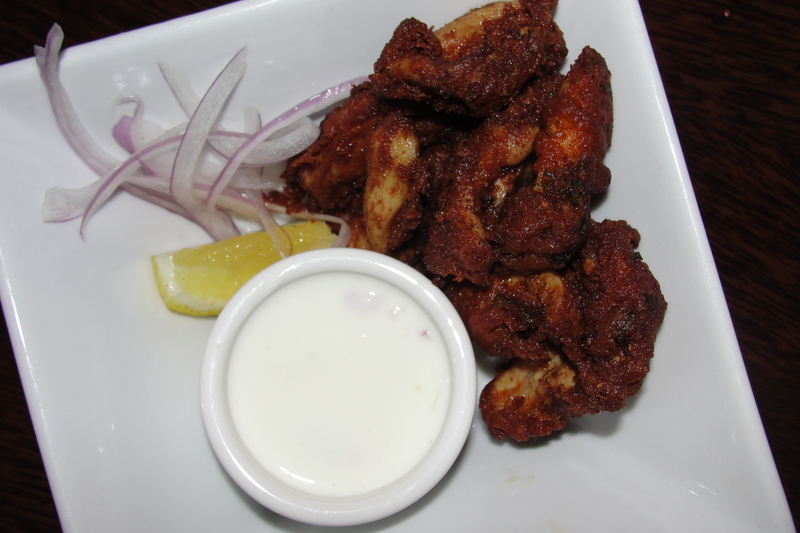 The chicken is organic and boneless and marinated in Straus yogurt with coriander and cumin and then fried. My friend Lisa described these as Indian buffalo wings. The sides of yogurt, lemon and red onion really balanced the spice out. Dosa offers a South Indian “home-style” cuisine, which is different from the heavier, clay pot type Indian food I am used to eating, which comes from the north. 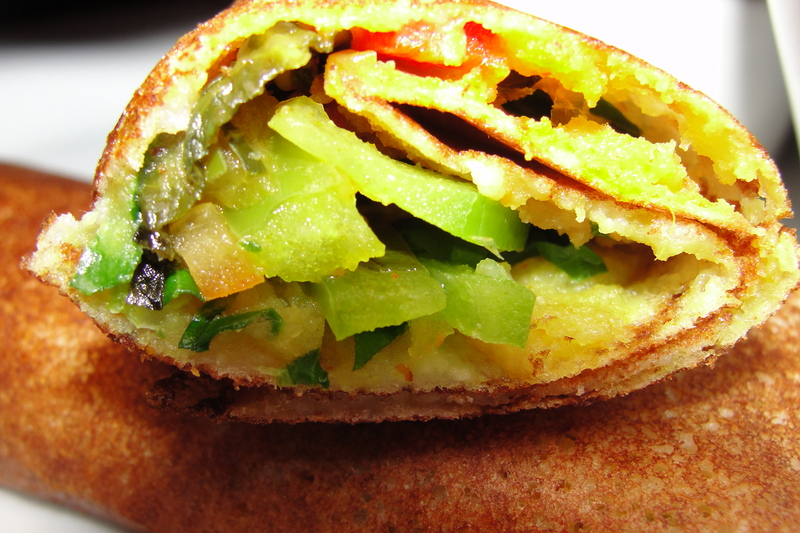 Their specialty is dosa, which is a savory crepe like food, constructed from rice and lentils. The combo of rice and lentil almost never gets me excited. I truly considered skipping this course, thankfully I didn’t! Rice and lentils always surprise me and I have to remember that half of the world’s meals are made from these two basic ingredients. Don’t quote me on that statistic, I just pulled that one out of my, uh…head. The dosa I chose was Summer Vegetable, loaded with collard greens, bell peppers, ground lentils & chiles. 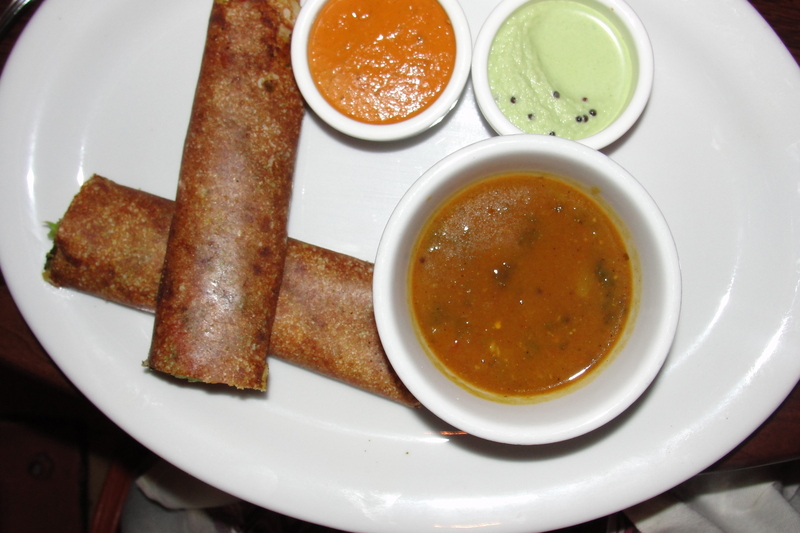 Each dosa comes with three dipping sauces, if you will. Coconut & tomato chutneys along with sambar, a lentil dipping soup. Can’t escape the lentil in this course, can you? I was so pleasantly surprised when I took my first bite. It was after my dosa I realized that I need a cocktail! I couldn’t blog about my dinner without a cocktail, right? See, Food it Forward is keeping me well nourished and hydrated. My pal had ordered her second Ginger Ante, so I thought I would follow suit. What a mysterious drink! It tastes as deep and frosty as it looks. The rum is so smooth and barely noticable (aka: dangerous.) 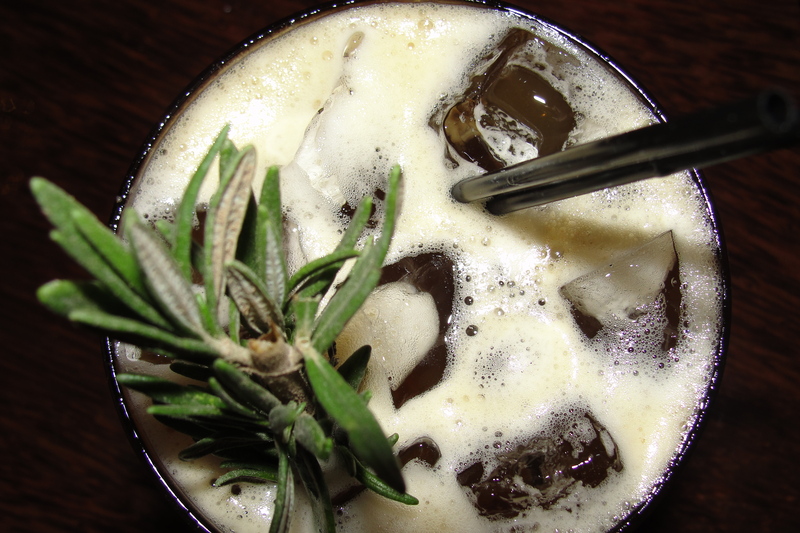 The smell of the giant rosemary garnish adds to the complex mix of flavors that the Ginger Ante offers up. We couldn’t quite put our finger on the sweetness that filled the middle of this drink. Jody (my co-ginger ante pal) mentioned she tasted apricot. Looking further into ginger jaggery nectar, I found …nothing. What is ginger jaggery nectar, anyone know? Another reviewer mentioned that this drink would be a perfect cocktail to serve at Thanksgiving and one more deemed it, dark and stormy. Perfect descriptions. Third course is on its way. Who’s ready for a big pot pie? 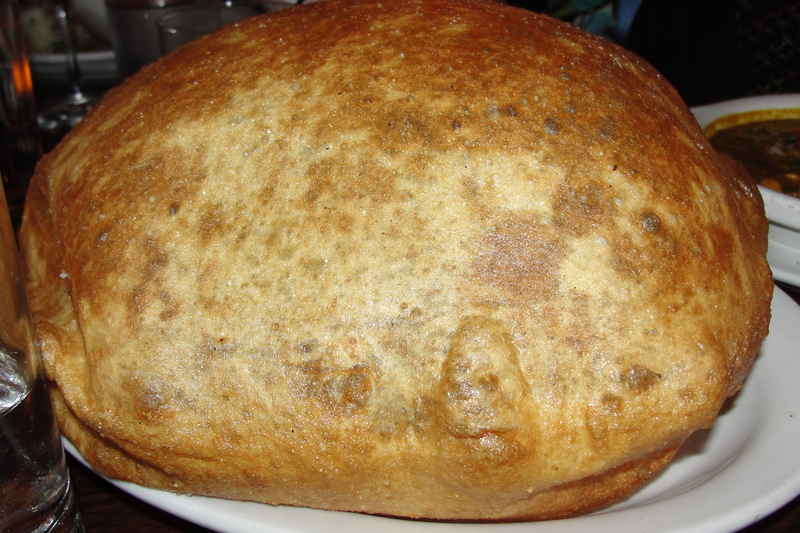 Not really, this is Channa, which comes with… Bhatura. Together they make…Channa Bhatura. Which is the most exotic way you can imagine to say, bread and lentils! This was the main entree for our hostess, Gheeta. My third course was Shrimp Masala. This loosely translates to hot, creamy masala flavored bowl of shrimp with coconut rice and cool yogurt. Please know that I’m lying again. Coconut milk, red chiles, ginger, onions & spices.hile this part of the meal was as delicious as any other, it reminded me the most of the North Indian cuisine that I love. Once again folks, I sacrificed for you. I had dessert. While tempted to order something special to Dosa, like their Coconut Custard Cake or Rasmalai (a sweet vermecilli dish), I stuck with familiar chocolate. Bad move. Gheeta ordered the cake as well and thought it was really dry. I didn’t love the deep flavor in this cake. 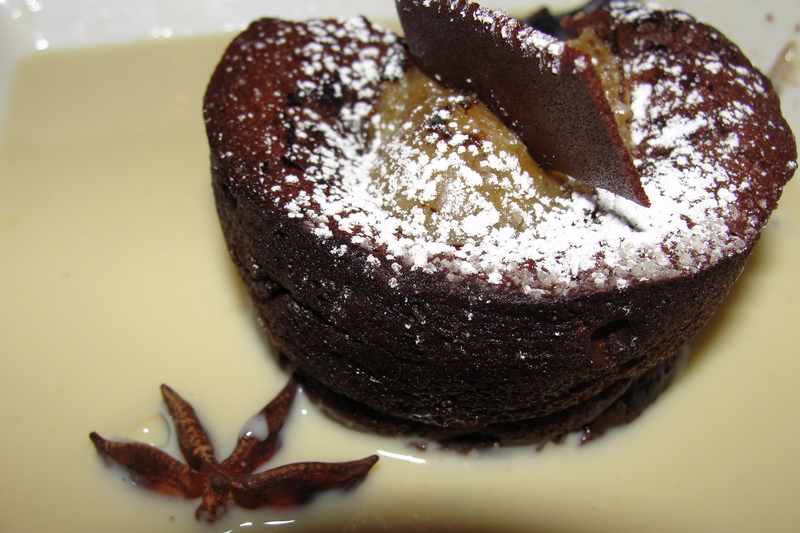 The menu says the cake is over a 3 spiced creme anglaise. Let me translate that for you. Creamy, cinnamonISH dipping sauce for your standard frozen, microwavable cake dish. Not the best way to end a great meal. Otherwise, Dosa was a fantastic experience. I was with such a sweet, fun group of moms. I was out of my bubble of a suburb. I tried new foods and I laughed, a lot! I’m still trying to wake up with my cup of coffee and decide how to repad my bank account. Did I mention that last night’s meal set me back $75? Um, yeah…I’ve got some ebaying to do. We were invited up to Angels Camp (gold country) for the night. It is so beautiful at this creek side home of cottages. There is plenty to do, but the boys are interested in doing is swimming and playing on the swings. Dinner is yet to come, so not much on the food front. More than anything I just wanted to say hello! I would wake up at 5 am to see Gary Gnu and The Great Space Coaster back in the day. Anyhow, like I said, no real news here today. I spent the day actually hanging out with my kids. Leftovers for lunch, Whole Foods pizza for dinner and an evening kid’s concert. I am so ready for my night out tomorrow! Tomorrow is Friday and I can feel it in me bones. I’m actually going to attempt to cook something with my kids. Wish me more than luck! I don’t know what I’ll try to whip up, but I’m sure it will be something messy and involving sugar. Oh, hey…it’s a buy one get one free drink week at Peet’s right now. Head over to www.Peets.com and sign up for their emails. You’ll get your coupon to print or you can just show the cashier your phone. I love Peet’s! They serve up caffeine with a side of coffee. Do you remember how I mentioned Dosa a couple weeks back? 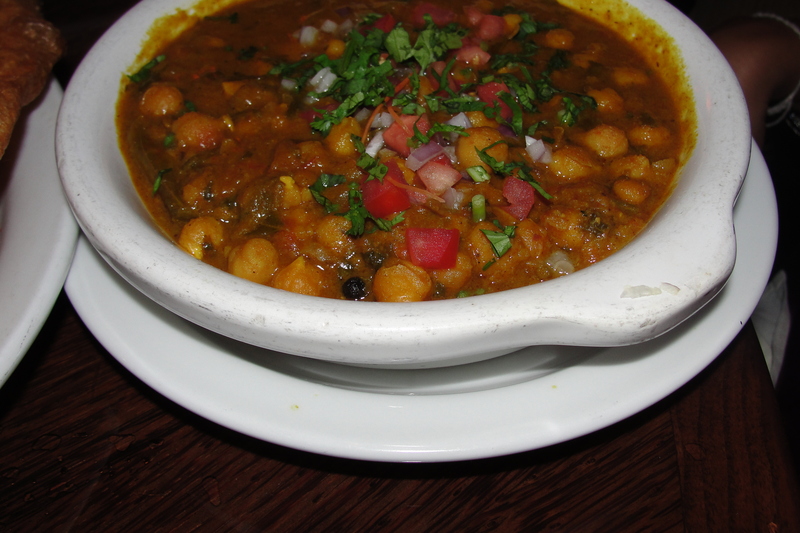 It’s a swanky San Francisco spot with local, organic (when possible), Indian fare. I’m headed there tomorrow night with some fellow moms. Hoochie Coochie! Well, that doesn’t seem like the right saying, but I’m really trying to branch out from Boo-yeah. You know what else? Dosa is rumored to have some serious, yet delectable drinks! In other food news, tomorrow night Dallas will try his first Slurpee! Crazy, eh? He’s four and he’s never tasted the sugar that paid for his mom to go to college. Luckily, he’s spending the night with Grandma and Grandpa. Brain freeze will not be on my list of worries tomorrow night!